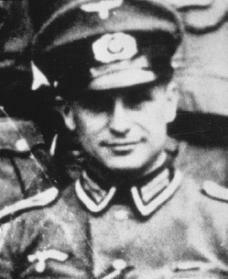 Klaus Barbie, known as the "Butcher of Lyon," was a leader in the Nazi group called the SS, and was head of anti-Resistance operations in France during the German occupation of World War II (1935–45). As a war criminal (someone who commits crimes that violate the conventions of warfare during wartime) Barbie lived in Bolivia as Klaus Altmann for thirty years before he was arrested and returned to France for trial. Klaus Barbie was born October 25, 1913, in the town of Bad Godesberg, a few miles down the Rhine River from Bonn, Germany. The son of a schoolteacher, he spent an uneventful childhood as a good but not brilliant student with a gift for languages. His father had served and had been wounded in World War I (1914–18). Klaus Barbie grew up in a Germany that had been bitterly humiliated by its defeat in the war. Barbie's father died in 1932, leaving the family with little money. With no funds to go to college, he began working for the National Socialist Germany Workers Party (Nazi Party), the party that brought Adolf Hitler (1889–1945) to power in Germany. Hitler became chancellor (head of the government) of Germany in 1933. Two years later, when Barbie was twenty-two, he joined the Shutzstaffel (SS), the Nazi Party's security squad that swore loyalty not to Germany but to Hitler. He served in the Sicherheitsdienst (SD), the intelligence and security branch of the SS, and was assigned to a number of posts in Europe for the next six years. During this time, as the German war machine swept westward, Barbie won a reputation as a shrewd, dedicated SS officer. He earned increases in his position, and admiring superiors expressed their approval of his performance. After Germany invaded France in 1941, Barbie became head of operations to control the Resistance, the underground organization of French patriots resisting Nazi rule. He is widely believed to have been responsible for the torture and death of Jean Moulin (1899–1943), the secret head of France's anti-Nazi coalition. As head of the Gestapo security police in Lyon, Barbie also appears to have been responsible for a number of "actions" against innocent French Jews. Among them a raid on an orphanage in the town of Izieu, which sent over fifty boys and girls to the gas chambers at the concentration camp of Auschwitz in Poland. When the war in Europe ended in spring 1945 with the Nazis' defeat, Barbie hid from the Allies (the nations allied against Germany, including Great Britain, the Soviet Union, and the United States) until April 1947. At this point he was recruited by the Counter Intelligence Corps of the U.S. Army in occupied Germany. Although the army had a warrant for Barbie's arrest as someone suspected of underground activities, the regional commander decided that his skills as an interrogator (someone who questions suspects or prisoners) made him more valuable as a spy than as a prisoner. Over the next four years Barbie took on increasing responsibility for the army. At one time he ran a spy network that included scores of informants in East and West Germany and France. Barbie soon became one of the army's most trusted spies. In 1949, however, his presence became known to French war crimes investigators, who demanded that the "Butcher of Lyon" be turned over to them to stand trial for his crimes. The U.S. army took a fateful step. It decided not to surrender Barbie to the French, fearing embarrassment by his service and worrying that he might disclose wide-ranging U.S. intelligence efforts to the French. With the aid of a Croatian priest, it delivered Barbie to Genoa, Italy, under the false name of "Klaus Altmann." There he and his wife and two young children boarded an Italian ship to Buenos Aires, Argentina. The "Altmann" family quickly moved to the mountainous city of La Paz, Bolivia, where Barbie supported himself as an auto mechanic. Barbie's skills as a spy did not go unnoticed in the military government of Bolivia, and before long he became an associate of high-ranking generals. It is likely that he served as an adviser to Bolivia's secret security police. It is known that he became the director of Transmaritima Boliviana, a company organized to hire ships to bring supplies to land-locked Bolivia. He lived as any prosperous businessman might and was often seen in La Paz's cafes and restaurants. The past began to catch up with Barbie in 1971. Beate Klarsfeld, a German-born homemaker married to French lawyer Serge Klarsfeld, discovered from a German prosecutor's files that Barbie was living in Bolivia under the name of Altmann. In a dramatic move, she went to La Paz and chained herself to a fence, demanding that "Altmann" be tried for his crimes. Although Klarsfeld's initial effort was unsuccessful, the spotlight of publicity was on Barbie to stay. For over a decade, "Altmann" denied that he was Barbie, but his identity was no secret to the regimes that had kept Bolivia under military rule. Finally, in 1982, a civilian government came to power. In February 1983 Barbie was arrested and turned over to French officials. Barbie's return to France created tremendous publicity and soul-searching in the country, which had never fully come to terms with its mixed record of both collaboration with and resistance to the Nazis. Shortly after his return, the prosecutor in Lyon announced that Barbie would stand trial on several charges of "crimes against humanity." These events had consequences in America as well. Following a five-month investigation, the U.S. Department of Justice revealed Barbie's post-war role for U.S. intelligence and issued a formal apology to France for "delaying justice in Lyon" for nearly thirty-three years. Like nearly all the others who committed horrifying deeds under the Nazis, Barbie showed little remorse for his crimes. "There are no war crimes," he said. "There are only acts of war." When he was expelled from Bolivia, he seemed indifferent, saying, "I did my duty. I have forgotten. If they [the French] have not forgotten, that is their business." The French had not forgotten. Nevertheless, three years after his return Barbie was still in a jail cell in Lyon, with no date set for his trial. The long awaited trial was again delayed in 1986, when the French Court of Indictments ruled that Barbie could be tried for crimes against Resistance fighters as well as for "crimes against humanity." Barbie was imprisoned for life in 1987 for crimes including the murders of at least four Jews and Resistance workers and fifteen thousand deportations to death camps. He was the last German war criminal of rank to be tried. Barbie died of cancer in a prison hospital in Lyon on September 25, 1991. Beattie, John. The Life and Career of Klaus Barbie: An Eyewitness Record. London: Methuen, 1984. Murphy, Brendan. The Butcher of Lyon: The Story of Infamous Nazi Klaus Barbie. New York: Empire Books, 1983.